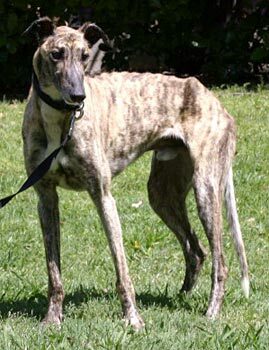 Santa Fe, aka Hallo Santa Fe, is a handsome, 2-year-old dark brindle male born July 1, 2006. His sire is Dodgem By Design, making his grand sire the late Gable Dodge, and his dam is Sol Sassy, making his grand sire the famous Molotov. Santa Fe was found as a stray and taken to Ft. Worth Animal Control. 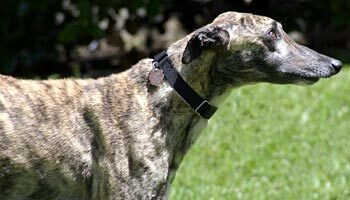 He was positive to Ehrlichia, Babesia, and Lyme disease, and he has been successfully treated for all. Santa Fe is ready to find his forever home! Santa Fe had very little interest in the cats, which proceeded to zero interest. He didn’t even care about the meow. As always, we advise close supervision when introducing a dog to new feline family members. Santa Fe has been around several small (rat terrier size) dogs and seemed to have very little interest except for the occasional sniff introduction. 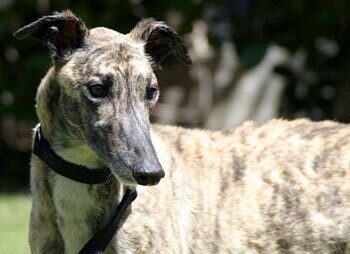 Whoever thought greyhounds were silent and didn't talk hadn't met Santa Fe. Mr. Santa Fe speaks several languages: dog, wookie, and roo to start. We've often thought that he might be some alien species with his cute wookie-speak, and considered that he might be more aptly named "Chewbacca." When he is excited about coming indoors, he'll roo. He happily barks when his people arrive home, and he successfully kept a sweater from moving by barking at it. True to his greyhoundness, however, he doesn't bark at strangers at the door. In fact he is exuberantly welcoming. Santa Fe is a two-and-a-half year old with a very young, enthusiastic soul. He is also incredibly smart, learning new behaviors easily. Among his "tricks" is his ability to carry jars around the house and open them. He has taught us to carefully close all closet doors. In the few weeks since being in our house, he has a much better "stay", has learned "walk" and "wait," while out on a lead; is quite good at "taking turns" for attention; has a good "leave it" and is learning "nice" which is the direction for how to take treats gently. He came knowing sit, lie down, and wait when it meant remain calm for dinner. When he wants to go out, he'll use a doggy word which is clearly different from his other barks. Santa Fe is learning to play with toys, and truly enjoys shaking them. He also enjoys carrying shoes, although he doesn't chew on anything inappropriate - ok, except plastic bags. He LOVES plastic of any type (so keep those away from him!!). He also enjoys a good rawhide chip, and definitely enjoys treats and dinner. Santa Fe doesn't seem to have much of a prey instinct. While his greyhound housemates will run out and immediately look for squirrels to chase, he trots in a different direction. Santa Fe loves people attention and will contently lay his head over you for the sheer pleasure of being close. This is a dog that will delight with his antics, and make you laugh out loud. He also still needs some human patience with regards to gaining more mature and sedate behavior. He might benefit from an obedience class, although he does know many of the basic behaviors. Santa Fe is one dog just happy to be here, happy to be with you, and happy with the world. His happy disposition is infectious.